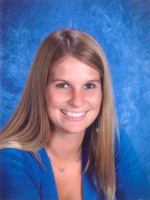 My name is Lindsey Atkinson and I am a Math Resource Teacher at Sleepy Hollow Elementary. I have always been passionate about teaching and mathematics. I have had the privilege of teaching and mentoring students in grades K through 5 and feel blessed to have had these opportunities. I have been teaching for six years and have been a classroom teacher, Responsive Classroom Lead Teacher, Coach of Girls on the Run, and a tutor and mentor to many students. I taught fourth grade for three years and third grade for two years before I began pursuing my career in the Math Specialist Field. I just completed my first year as a Math Resource Teacher and it has been one of the most fulfilling experiences of my life. I studied at Virginia Tech and I earned a BS in Human Development in 2006 and a Master’s degree in Elementary Education in 2007. I am currently enrolled in the Math Specialist Leadership Master’s Program at George Mason University. Although having the Math Specialist Master’s was not required for my position, I wanted to truly become a specialist in the area in which I am teaching and help teachers as well as students to the best of my ability. George Mason has an excellent Math Specialist Leadership Program and I have gained so much from the three courses I have already completed. I have shared many lessons, assessment resources, project ideas, rigorous problems, and activities that require students to use the five process standards of mathematics with the teachers of Sleepy Hollow. I have had the privilege of leading presentations on these topics at Stuart Pyramid Math Conferences to a variety of teachers, specialists, and principals. I want to continue taking courses towards this master’s degree so that I can continue to grow in my own knowledge of teaching and mathematics and so that I may become the best resource that I can for teachers and students. By the end of this school year I will be halfway through George Mason’s Master’s Program and will be that much closer to earning my Master’s and endorsement as a Math Specialist. I am so appreciative about receiving the AMTE Elementary Mathematics Scholarship and am excited to continue studying and learning so that I may be successful in my field as a Math Resource Teacher.